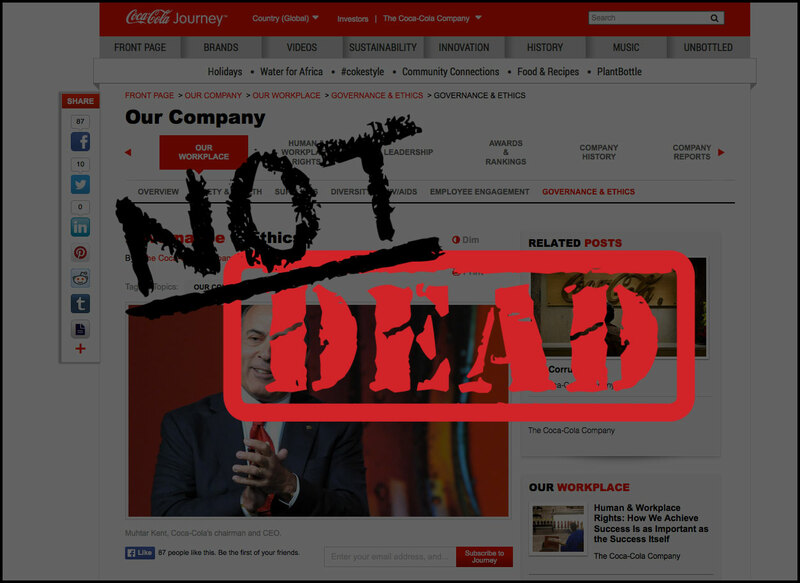 On November 11, 2013, Coca Cola said that the corporate website is dead. Even though Coca Cola had no evidence to back up such a drastic statement, there where quite few questions asked and the myth of the corporate website’s death seems to live on. So let’s kill this myth now and move on, here’s why. First of all, Coca Cola doesn’t even believe it. Sure, they’ve spiced up their website with storytelling created by a huge editorial team and a different navigation, but with a look under the hood you’ll find the same content that you’d expect to find on any corporate website. Look at their investor relation pages and their pages for governance & ethics or sustainability. Nice design and good content, but still a pretty classic corporate website, with all the stuff that corporate stakeholders expect to find there. Not much new and not dead at all. Part of the Coca Cola corporate website. Ordinary, standard and not dead. But what about the stakeholders, are they leaving the corporate websites to die? Content marketing thought leader Michael Brenner, previously at SAP, now at a content agency is perhaps the biggest player when it comes to dooming the corporate website. His text about the death of the corporate website is the most read article on this subject and has been posted on his own blog B2B Marketing Insider, LinkedIn and even Forbes. He has also been tweeting out links to them regularly for almost a year. Brenner’s “proofs” of the corporate website’s death are that number of visitors are decreasing, the customer journey happens mainly elsewhere and that the most traffic is concentrated to 10% of the pages on the website. Sure, numbers of visitors decrease because people have more places to find information on nowadays. The average FT100 company has 320 different social media accounts (Source: Nexgate) and produce more and more content outside the corporate website, to be where customers are. But that doesn’t mean that the corporate website as a hub for corporate information is dead. Corporate communication has just become more fragmented. And it’s very natural for a website to have an uneven balance of traffic. Obviously a career front page will be more visited than an anti-corruption policy, but they both have an important place to fill. Common proofs of the importance of the corporate website can also be found in Webranking by Comprend, Europe’s leading survey of corporate websites and the only global ranking that is based on stakeholder demands. In Comprend’s research, the vast majority of corporate stakeholders (journalists, job seekers, investors, general public, government etc.) say that their first stop for company information is the corporate website, followed by Wikipedia. I’m all for evolving corporate websites to better meet stakeholders demands and not publish content that noone wants just because “we’ve always had that information there”. That’s what I try to do every day at work as a corporate content strategist. But to claim that the corporate website is dead is either simple click bait or plain ignorance. Let’s hope for the former. Disclaimer: I work as a content strategist at digital agency Comprend that is mentioned in the text. This entry was posted in Content, Digital communication, Posts in English. Bookmark the permalink. Hello Joakim, and thank you for covering and responding with your own point of view. I do not disagree at all with your premise that “the corporate website as a hub for corporate information is” still very much alive. My contention is that the corporate website of today is very much, if not exactly like the corporate website of 1994 – an online brochure. In looking at the broader perspective and larger trends of the digital journey the typical buy takes, there are a few issues: 1) buyers spend more time researching products and solutions from others. The actual number of searches for corporate websites as a % of all searches is down dramatically. And 2) the vast majority of content created and loaded into corporate websites is never consumed by anyone. Ever. That is a waste of corporate time, money and resources. I believe that some companies are starting to slowly evolve their corporate website in a few ways. First, they are adding more information and focusing less on the promotional components of the traditional online corporate brochure / website such as in the “About Us” section. Second, many companies are beginning to look at the cost, the utilization and the actual effectiveness of the content they publish. Not just on their websites, but also across the enterprise. You can accuse me of click bait for two and exactly two traditional marketing approaches: the corporate website and banner ads. Why? Because 99.9% of the content posted is completely ineffective. So I am guilty — if you believe we should continue supporting banner ads no one wants and corporate website structures and content no one reads. As marketers, business people, and especially those of us in the content business, I know we can do better. In the end, I realize we had different frames, but we are on the same “team.” You are speaking about corporate websites as hubs for corporate information. I am looking at the buyer journey as a whole. I think we can both agree the corp website can be improved. I am sure you are working to make them better, as I am arguing to make them more important in the larger journey. Either way, I think this is an issue worth discussing and debating. Thank you Michael for taking the time to answer. I totally agree that far too many corporate websites are still corporate brochures and that’s something that I think both of us are trying to change. I have a background in the content marketing industry and believe that corporate communication has things to learn there. And you’re also right about the customer journey largely taking place elsewhere than at the corporate website. But with all the channels being used nowadays, the corporate website is the place to provide the full picture of a company, focusing on corporate stakeholders. For example, some of our clients see their whole website as a continuously updated annual report. So the corporate website is not dead and not dying. It definitely needs to be modern and engaging, but also serve classic corporate stakeholders with more “dull” content such as investors who only want to download an Excel document and nothing else and some job seekers that just want a list of job offerings. I’m not sure from where you got the numbers to say “the vast majority of content created and loaded into corporate websites is never consumed by anyone”, I don’t think that’s true, but I will have to check stats from the corporate websites that we run to be sure. And you’re quite off comparing banner ads and corporate websites, I can ensure you that the information on a corporate website reach a higher number of its target group that 99,9%. As a summary: I agree that most corporate websites should evolve with better design and better content with a clear purpose.